T.A.T.U :: Просмотр темы - Whats your desktop look like? 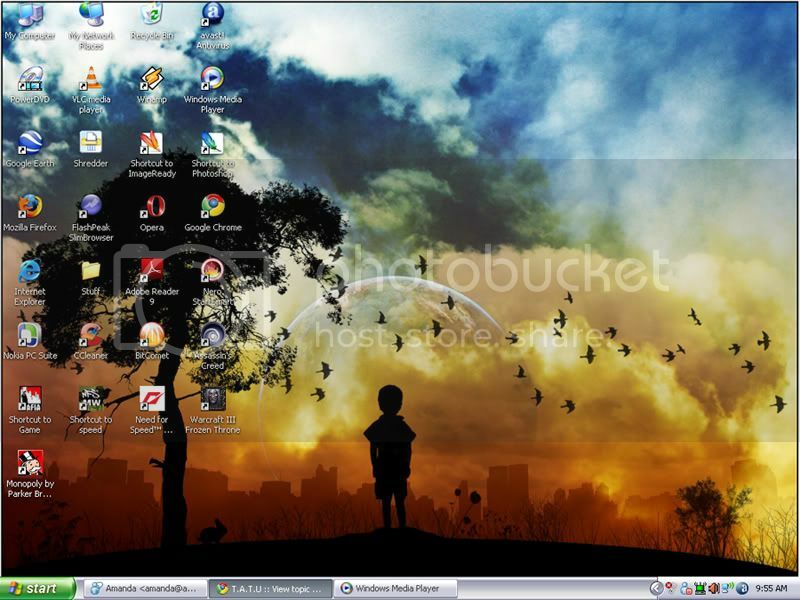 Добавлено: Сб Июн 20, 2009 4:21 am Заголовок сообщения: Whats your desktop look like? I've reduced the size a bit but meh! [quote="azulan"]I've reduced the size a bit but meh! That topic is for tATu related screenshots. "What's your favorite TATY PrtSC shots...?" But most people have missed out on the first line and post whatever. People are posting their desktops regardless of the fact that they have t.A.T.u. in or not. ^ It's okay. It's not a big deal. I'm back on this wall.. Learn how to use Imageshack and their thumbnail feature people. OR make your images smaller by scaling them down! I was about to do it, but as others had already maken this page's space or how ever to call it that big it doesn't hurt anybody anymore.